While appearing on Fox News Sunday, Democratic nominee Hillary Clinton once again called into question the truthfulness of the families who lost loved ones during the September 11, 2012, terror attack in Benghazi. “I don’t hold any ill feeling for someone who in that moment may not fully recall everything that was or wasn’t said,” she told Chris Wallace. She is completely UNFIT to be Commander-in-Chief. She only cares about herself. She is Satan's daughter.???? 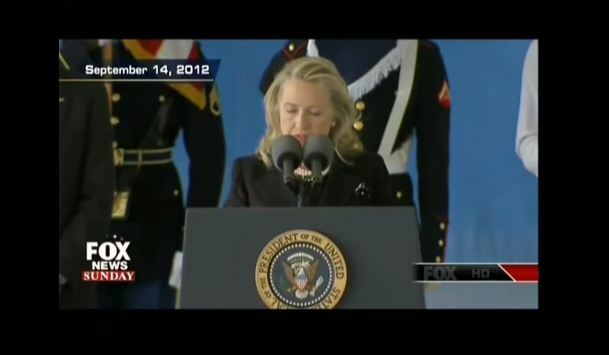 In the days immediately following the attack in Libya, Clinton cited a video rather than terrorism as the root cause of the attack that September day in 2012. Despite her claims that she did cite terrorism immediately, a detailed accounting of the events following the attack by FactCheck.org shows Clinton did not mention terrorism until September 20, a full six days after she met with the grieving families. But how many of that 68 percent will vote for her anyway?